An artifact is a unique and unusually powerful magical item. Many of the artifacts in Morrowind have appeared in other Elder Scrolls games, as listed at the Lore article on Artifacts. Artifacts are specifically defined as anything with a unique appearance. 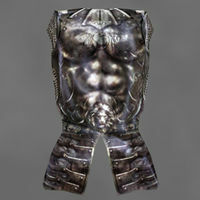 This is opposed to Unique Armor, which are defined as those which there is only one of, but which have the same appearance as other generic items. 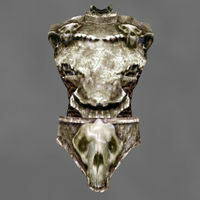 There are a number of armor artifacts that can be found throughout the game of Morrowind. For Tribunal and Bloodmoon artifacts, check the Tribunal Artifact Page and the Bloodmoon Artifact Page. Armor Rating is given both as base values and Max values, which apply when you have 100 points in the relevant armor skill. Charge/Cost= Uses indicates how many uses on average you can get before needing to recharge the armor (or wait for it to charge on its own). Note that the Cost depends on your Enchant skill, so your results may vary. Only the most exceptional magical items and artifacts are included here. 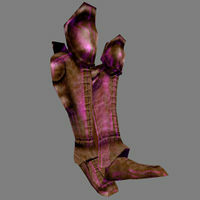 The boots can be found in the underground section of the Berandas stronghold (south of Gnisis), on a dead warrior (in the large area to the northeast), and are part of an Imperial Cult quest. When Talos Stormcrown was a young man in Skyrim, he went into the mountains to learn the secrets of the Greybeards. He learned the secrets of the high peak winds -- the roar of the winter blast, and the warm silk of the summer updrafts. When he descended from the mountains, he came riding the clouds, striding through the air in great boots he claimed were gifts of the Greybeards for his cunning craft and riddling. After Septim yielded his crown, the boots disappeared, and have been lost for many years. As part of the Tribunal expansion, this artifact can be sold to Torasa Aram in the museum for 27,500 gold. Not much is known about the origin of the Ten Pace Boots. They're made of heavy leather and provide superior travel when jumping. 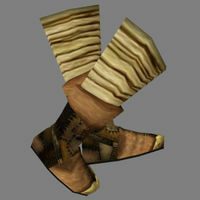 The boots are found in a locked chest in the Inner Shrine section of Bal Fell (on an island far east of Vivec), in front of the statue to Sheogorath. These boots were perhaps inspired by Seven-league boots of European folklore. 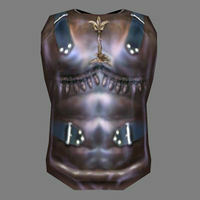 Found within the Mudan Grotto (southwest of Ebonheart), Central Vault, in a locked Dwemer closet. Contrary to the in-game description, the armor does not grant the wearer any Fire Damage abilities. The armor is obtained via a high ranking quest for the Tribunal Temple. See the Ebony Mail quest for more information. Despite being medium armor rather than heavy, this artifact ties the Dragonbone cuirass and Lord's Mail as the cuirass with the highest armor rating. However because it fortifies Shield by 50 points as a constant effect, it has the highest effective armor rating out of the three cuirasses. This artifact also appears in Arena, Daggerfall, with similar enchantments. In Skyrim, it appears with different effects. Found in Ilunibi (northwest from Gnaar Mok), Soul's Rattle section, behind the trough on the western side of the large room to the northeast (next to the Sixth House bells). These are the highest rated gauntlets in the game. 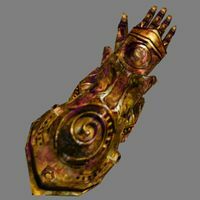 Wraithguard is a legendary gauntlet crafted by the Dwemer Tonal Architect Lord Kagrenac, in order to handle Keening and Sunder. Together they make the tools necessary to handle the Heart of Lorkhan. The right gauntlet is given to you by Vivec during the Main Quest. 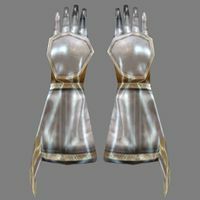 Alternatively, you can kill Vivec and have the Unique Dwemer Artifact glove found on his corpse activated as Wraithguard by Yagrum Bagarn, though not without some serious consequences for the player character (unless you are using MPP). See the Hortator and Nerevarine quest for more information. The second item ID is the one for a Wraithguard activated by Bagarn from the Unique Dwemer Artifact glove you get from killing Vivec. 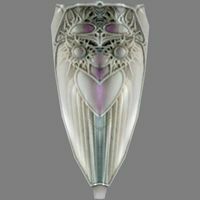 This version is left-handed, and has the appearance of a Daedric Left Gauntlet when worn. The Bagarn-activated Wraithguard does permanent health damage to your character because of a fault in the associated script. After receiving Vivec's Wraithguard, you can kill him and have the Dwemer Artifact turned into a second one, allowing you to have two. You can complete the Main Quest line without Wraithguard; it is just more difficult, since you will lose health continuously (50-125 damage/sec with 0% Resist Magicka) while using Keening or Sunder. The Resist Blight Disease effect is only significant if Wraithguard is obtained by killing Vivec. At the point in the Main Quest when Vivec would give you Wraithguard voluntarily, you would already have 100% resistance. Wraithguard also appears as an unobtainable card during the "The Tools", a quest in the Legends story expansion, Return to Clockwork City. Visit the shrine of Malacath, located on the long island in the Sheogorad Region west of the Sanctus Shrine island, to receive the start of the quest for the helm. See the Malacath's Quest for more information. 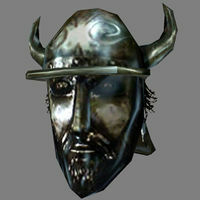 This helm also appears with a similar enchantment in Oblivion. The Masque of Clavicus Vile is related to an Imperial Legion quest, Sorkvild the Raven, received at Moonmoth Legion Fort. It can be found on Sorkvild in Sorkvild's Tower (east of Dagon Fel). This masque also appears in Daggerfall, Oblivion, and Skyrim, with similar enchantments. Held by Drelyne Llenim in Ghostgate, Tower of Dusk. 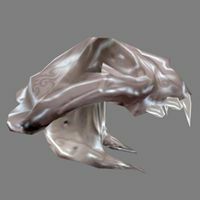 This artifact also appeared in Arena and Daggerfall, though it had a powerful enchantment in those games that it lacks in Morrowind, and also appears in Skyrim with the Dawnguard add-on. As part of the Tribunal expansion, this artifact can be sold to Torasa Aram in the museum for 8,500 gold. It is possible to obtain this shield without killing its owner, getting a bounty, permanently moving her or making her persistently hostile: Use a Command spell to take her outside Ghostgate, then spells or enchanted items to achieve a 100% chameleon effect on self. Enter sneak mode, and use powerful Disintegrate Armor spells on her from range until the shield breaks and is forced into her inventory. It will always break before her other armor because Disintegrate prioritizes shields first. At this point she will be hostile, but you will not actually be attacked and receive no bounty as long as you stay in sneak mode. Remain in sneak mode and use a ranged Calm Humanoid spell on Drelyne (any duration or magnitude), and she will become friendly again. Pickpocket the shield from her, and lead her back to her original place in Ghostgate with Command. Found in Ibar-Dad (along the coast east of Khuul), hanging above the skeleton in the innermost crypt. This shield has the highest armor rating in the game. Found in the Dwemer ruin Bthuand, which is near the northern coast of the mainland just west of the Daedric ruin Zergonipal. The shield is hidden among some rocks in the south-southeast part of the ruins near a dead adventurer. 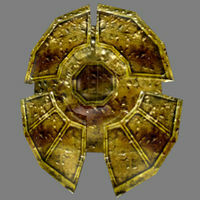 This shield is needed for the vampiric quest from Mastrius, in Salvel Ancestral Tomb. 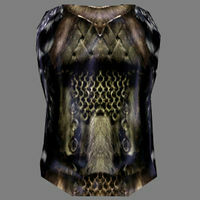 Unless you are a vampire and on Mastrius' quest, the shield won't be there. 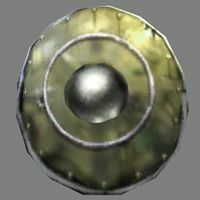 This shield has appeared in Arena, Daggerfall, Oblivion, and Skyrim, all with similar enchantments. This page was last modified on 7 December 2018, at 12:34.